Saute beef in a little olive oil until browned. Remove & reserve. Drain most of the fat from the pan, then sauté the onion and red pepper in the remaining fat until golden, scraping up any browned bits on the bottom of the pan. Add the garlic and jalapeno and sauté for a minute, or until fragrant. Add the tomato paste, chili powder, cumin and oregano and sauté for a minute, or until fragrant. Add all the remaining ingredients except the beans, and bring to a simmer. Cook for an hour. 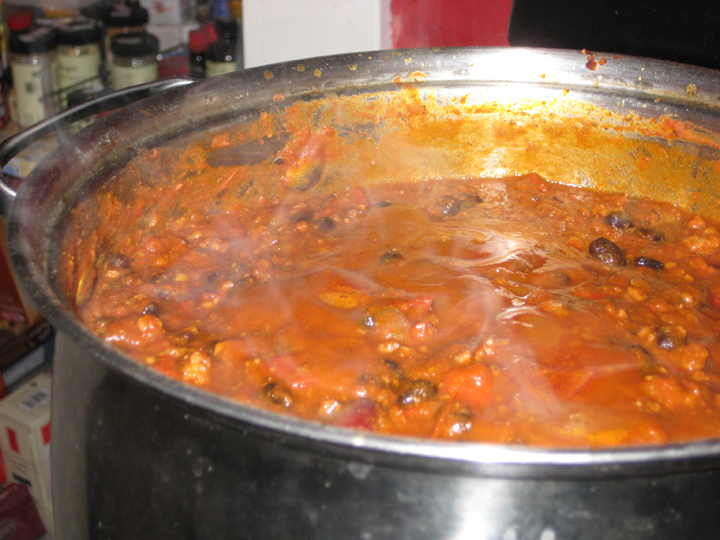 Add the beans to the pot and continue to simmer for 30-40 minutes, or until thick and reduced slightly. Adjust seasoning to taste. Like most chilis this will get better if you let it sit overnight and eat it the next day. This was a recipe that caused me endless frustration because all the recipe notes suggested using the entire can of creamed corn instead of the ¾ cup the recipe listed, but nobody was helpful enough to say what size can of creamed corn you should use in its entirety. Since creamed corn comes in a variety of sizes of cans it caused me a week’s worth of cross referencing recipes, dithering, worrying, changing my mind one way, and then changing it back another way, before I eventually committed to an 8 ½ oz can which seemed to work. This bread is very crumbly – not in the sense of being dry, but it does tend to fall apart a little in your hands as you try to smear butter on it. 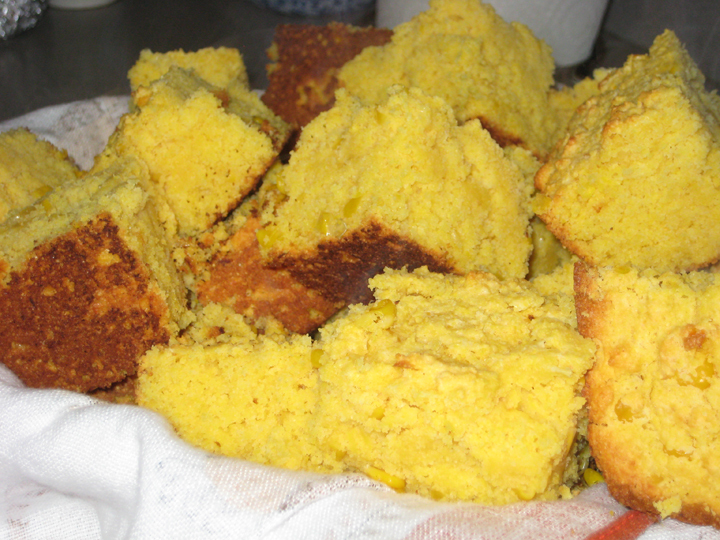 Perhaps this is the universe telling us that we don’t need to add butter to corn bread made with creamed corn, but that seems very sanctimonious of the universe and it was really good with (extra) butter. Preheat to 400°F. Butter 8-inch square baking pan. Whisk cornmeal, flour, sugar, baking powder and salt in large bowl to blend. Add creamed corn, butter and egg. Stir just until blended. If the batter seems too thick you can thin it with a little milk (do not use buttermilk). Spoon batter into pan. Bake until edges begin to pull away from pan sides and tester inserted into center comes out clean, about 20 minutes. Cool in pan on rack. Firstly, I could just eat this crust as a cookie. 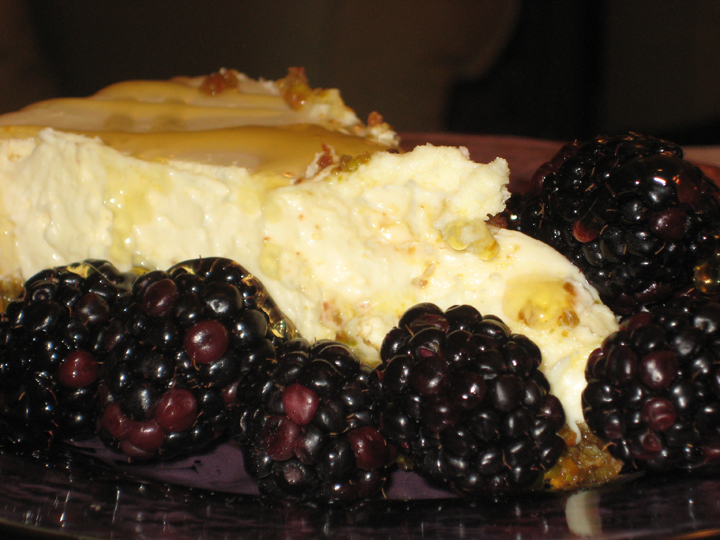 Secondly, this is phenomenally rich, even more than a classic cheesecake. This is one of the few times I will advocate for a reduced fat ingredient because I think using a full fat cream cheese here would be overwhelming. Thirdly, I wasn’t quite able to get a water tight seal on my springform pan when I baked it (despite multiple layers of tinfoil to try and prevent leakage) so my crust got a little soggy, but the cheesecake itself baked up perfectly creamy and without splitting across the top even a little bit. Pulse pistachios in food processor until crumbly but with some larger pieces intact. Add in sugar and almond extract, and give a few quick pulses. Add in cubed butter, all at once, and pulse until combined. Press crust into a 9” or 10” springform pan, using the base of a measuring cup to flatten and press against sides. Poke a few holes in crust bottom, and bake at 350 degrees for 10 minutes. Let cool completely before filling. Combine goat cheese and cream cheese in a mixer or food processor, and mix until smooth and creamy. Add in lemon juice, vanilla, and sugar, and beat/pulse until combined. Last add eggs, one at a time, pulsing/beating between additions until fully incorporated. Pour filling into cooled crust. Place springform in a large pan with 1 inch of water, reaching about halfway up the side of the springform. Bake at 325 degrees for 50 minutes. When done, turn off oven with the door cracked a few inches to cool evenly and prevent top from cracking. 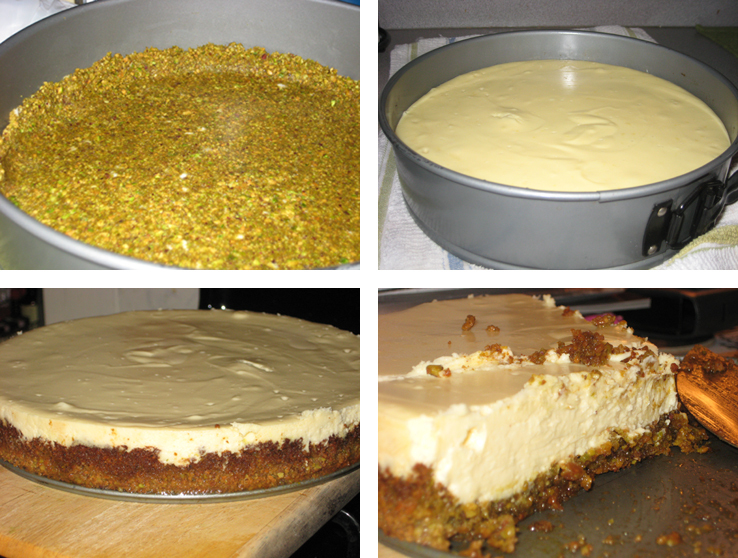 When cheesecake is room temperature, let cool in fridge for at least two hours.